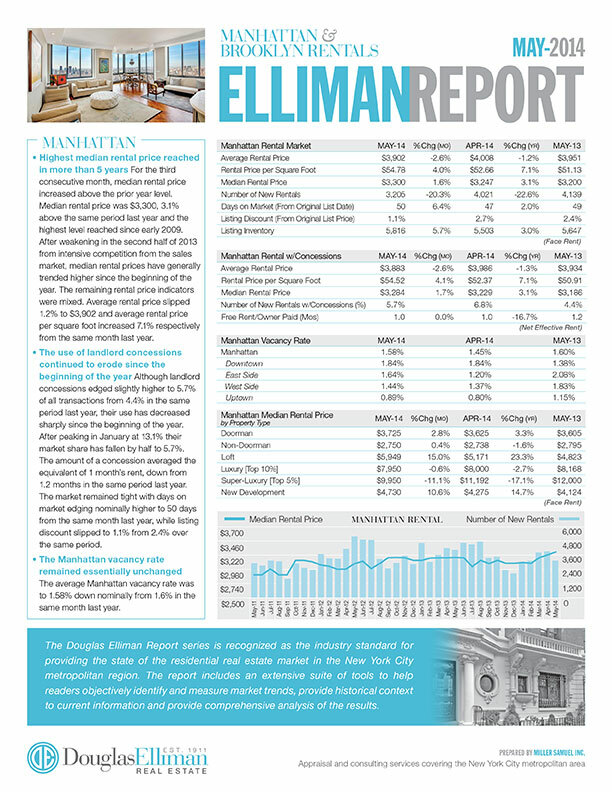 Today Douglas Elliman published the Elliman Report on Manhattan Sales that I author. 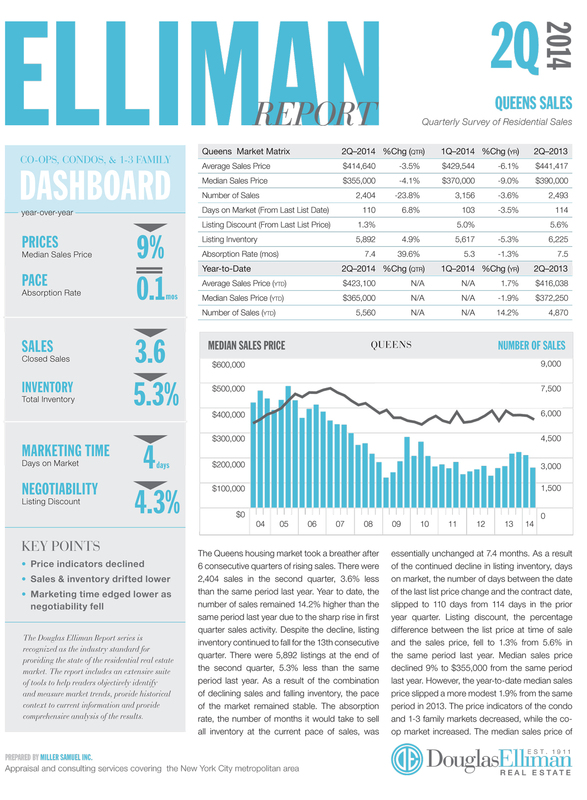 This quarterly report is part of an evolving market report series I’ve been writing for Douglas Elliman since 1994 (20 years!). Incidentally, we are tweaking the visual aspects of this Elliman report series – we do this every few years. We added a dashboard to provide at-a-glance information but expanded and yet consolidated the text to be one comprehensive section. I expanded the size of the charts but kept the matrix tables just about the same. Since this is a labor of love and a work in progress, please feel free to send along suggestions. – Sales increased for the 7th consecutive quarter, but less at a lower rate than the 27.6% average quarterly increase of the prior 4 quarters. – Median sales price for co-ops increased 9% as consumer sought out greater affordability as condos increased 0.8%. 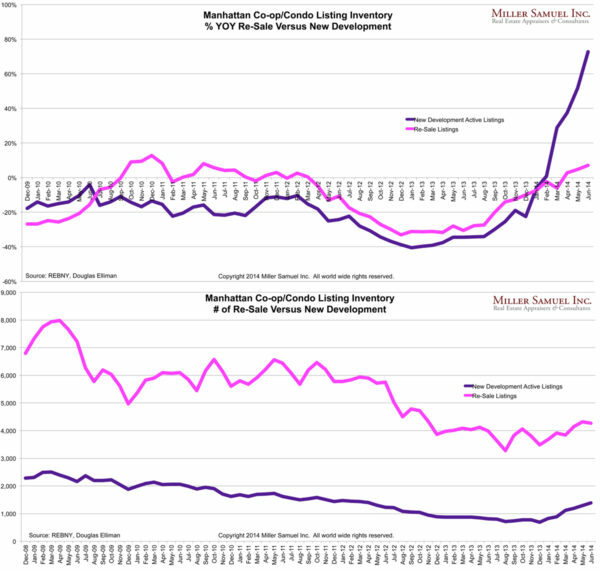 – Inventory is up from last year’s near record low. The inventory bottom appears to have been reached in 4Q 2013. – There were 45.9% listings that sold at or above list price, the largest market share in nearly 6 years. – Luxury price increases out paced the overall market. 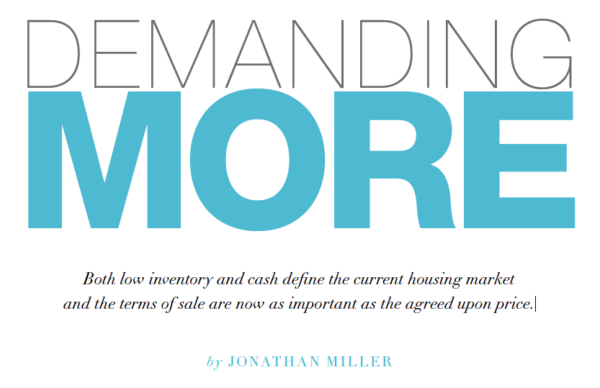 – Sellers are being both motivated and enabled to list as a result of rising prices. – Mortgage lending remains significantly challenging to buyers. I took a look at the change in new development inventory versus re-sale inventory both by year-over-year change (quite dramatic) and number of units. Both categories bottomed out at the end of 2013. 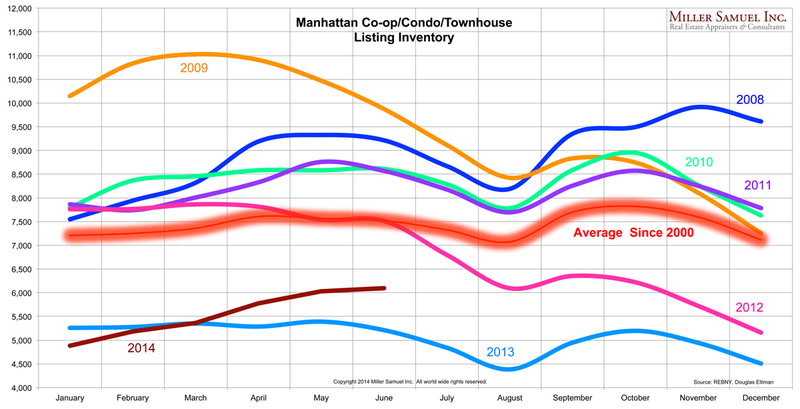 These trends are based on Manhattan co-ops and condos which represent more than 98% of the “non-rental” market. Much of the new inventory coming online is located within the “luxury” market which is the top 10% based on price. Got a call yesterday from John Ford, a reporter for PIX11 regarding the publication of Douglas Elliman’s Manhattan & Brooklyn Rental Report I author for Douglas Elliman. He’s a very nice guy and really listened to and presented the key findings of the report. Luciane Serifovic, Elliman’s Director of Rentals made a couple of good points as well. Fun! 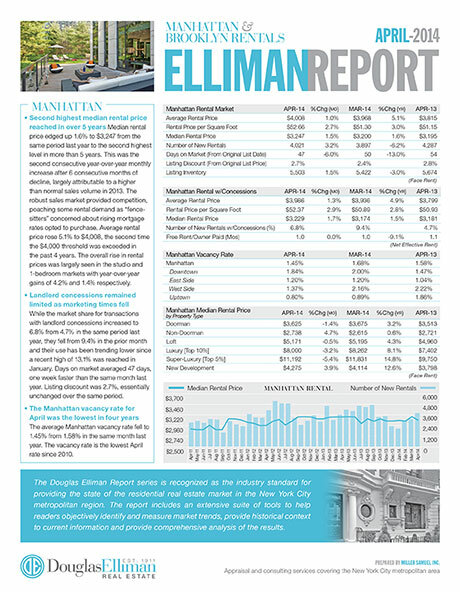 The report we author for Douglas Elliman covering the Manhattan/Brooklyn rental markets was published today. 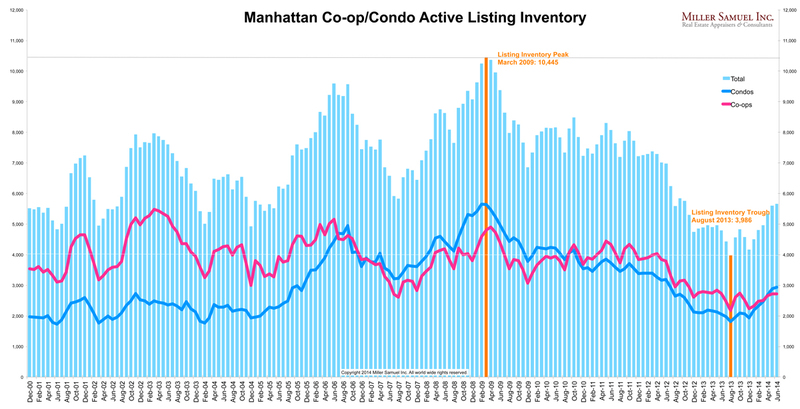 Back in February many observers of the Manhattan and Brooklyn rental markets were saying: “The Spread is Dead, Long Live the Spread!” Ok not really. But there was a lot made of the fact that the difference in median rental price between the two markets narrowed to $210 from as much as $1,125 in 2008. Manhattan rental prices had stabilized at the end of last year as Brooklyn continued to see sharp gains. But that was as close as it got. Since the beginning of the year, month-over-month Manhattan rental prices began to rise as Brooklyn started to level off. Manhattan rents cooled last year as the sales market poached demand from record volume. I saw the decline was temporary. The excess purchase activity from several years of pent-up demand has largely been absorbed allowing rents to begin climbing again. Brooklyn rents are beginning to level off as a result of all the new rental development entering the market soaking up demand. 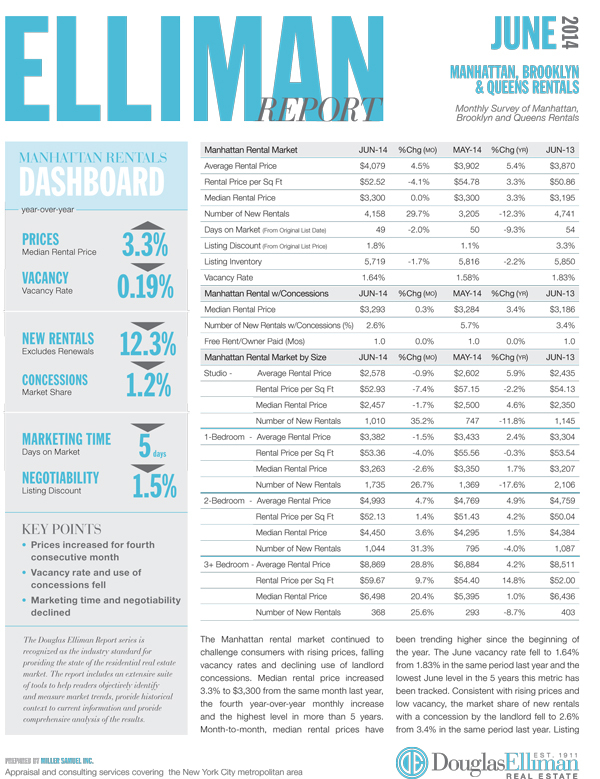 Today Douglas Elliman published the Manhattan/Brooklyn rental report that I author. 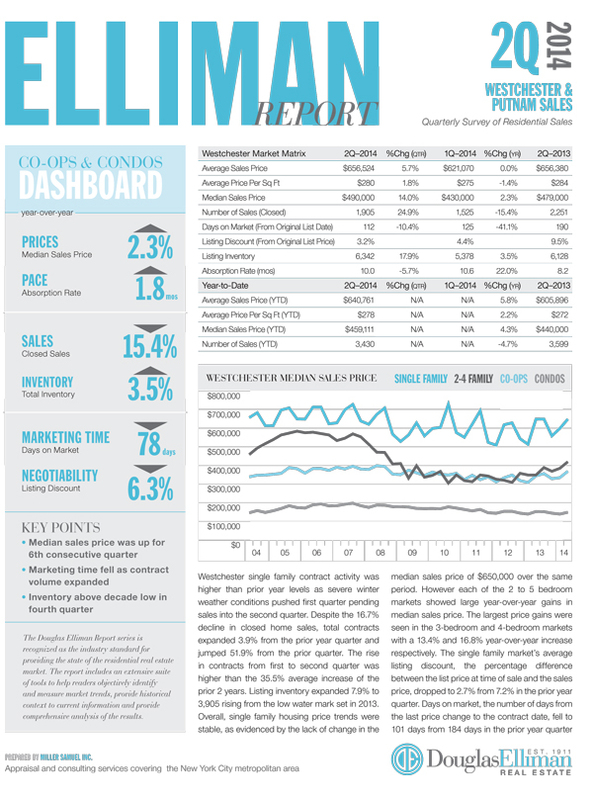 This monthly report is part of an evolving market report series I’ve been writing for Douglas Elliman since 1994 (20 years!). We discontinued the quarterly rental report series but still present the information in our aggregate database. 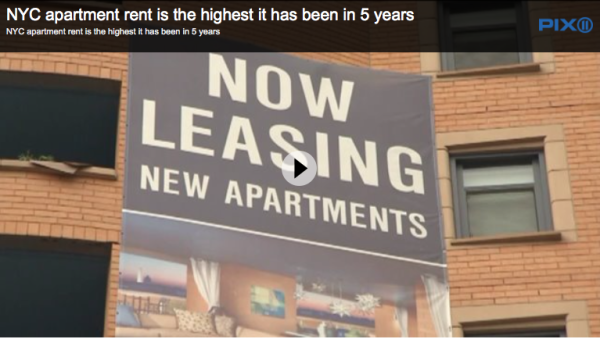 – Median rental price increased to the highest level in more than 5 years. – After softening in late 2013 with intensive competition from the sales market, median rental prices have trended higher since the beginning of 2014. – Although the market share of landlord concessions edged higher over the year ago level last year, they have fallen sharply from 13.1% in January. – Vacancy rate slipped nominally from same period last year, hovering near multi-year lows. – New rental activity fell reflecting the increased likelihood that tenants would renew their leases as a result of limited alternatives to increased affordability. – Median rental price increased from the same period last year but has showed some stability since the beginning of the year. – 2 and 3-bed apartments showed weaker price trends with the addition of new rental housing stock and intense competition from the purchase market. – There was a sharp drop in new rentals from the same month a year ago as more tenants were resigned to sign their leases at time of renewal. – Although marketing times expanded slightly, negotiability dropped sharply reflecting the ongoing tight market conditions. 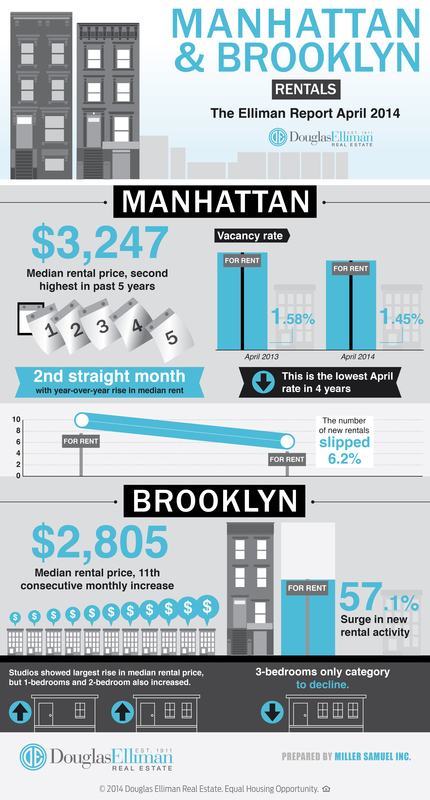 Here’s the latest infographic from Douglas Elliman covering the Manhattan & Brooklyn rental market reports for April 2014. 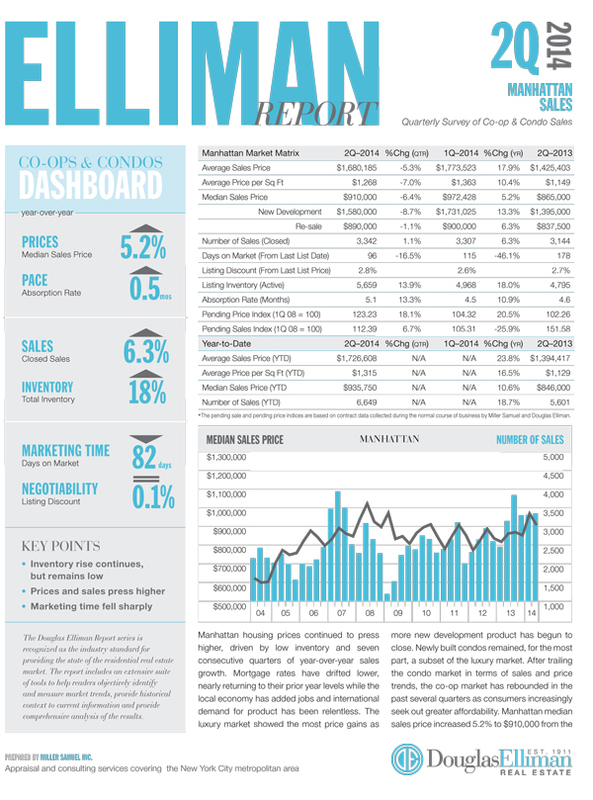 Douglas Elliman published the Manhattan/Brooklyn rental report that I author today. 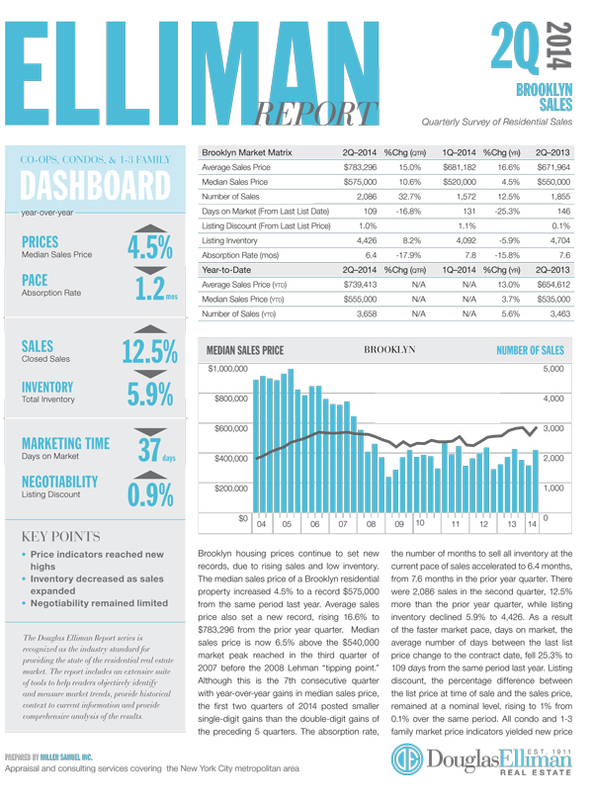 This monthly report is part of an evolving market report series I’ve been writing for Douglas Elliman since 1994. We discontinued the quarterly rental report series but still present the information in our aggregate database. – Second highest median rental price reached in over 5 years (highest was one month spike to $3,695 in Feb-09). – Second consecutive month with year-over-year rise in median rent after 6 consecutive monthly declines. – The vacancy rate was the lowest for an April in 4 years, falling to 1.45% from 1.58% a year ago. – Market share of landlord concessions was up slightly from last year to 6.8%, but down from recent January peak of 13.1%. – The number of new rentals slipped 6.2%, as landlords and tenants have remained more in sync for the 3rd consecutive month. – Median rental price up year-over-year for the 11th consecutive monthly increase. – New rental activity surged 57.1% as tenants pushed back against rising rents at time of renewal. – Marketing times and negotiability expanded from a year ago, but remained stable over the past 3 months. – Studios showed the largest rise in median rental price. 1-bedrooms and 2-bedrooms also increased. 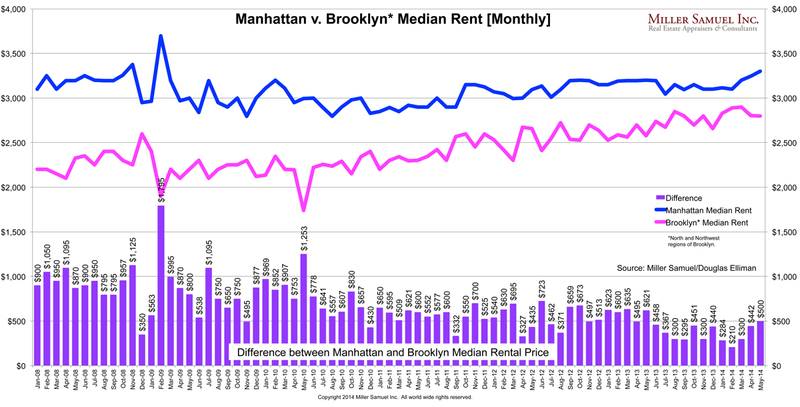 – Brooklyn median rent was $442 less than Manhattan median rent, up from $210 record low in February. 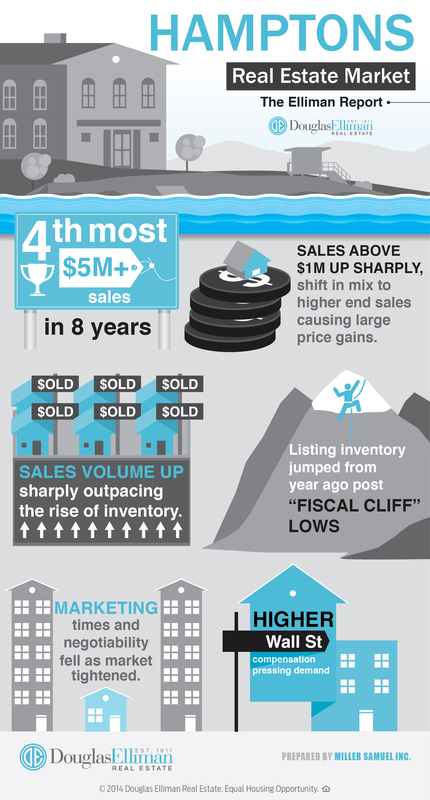 Douglas Elliman created another infographic for the Elliman Report series. 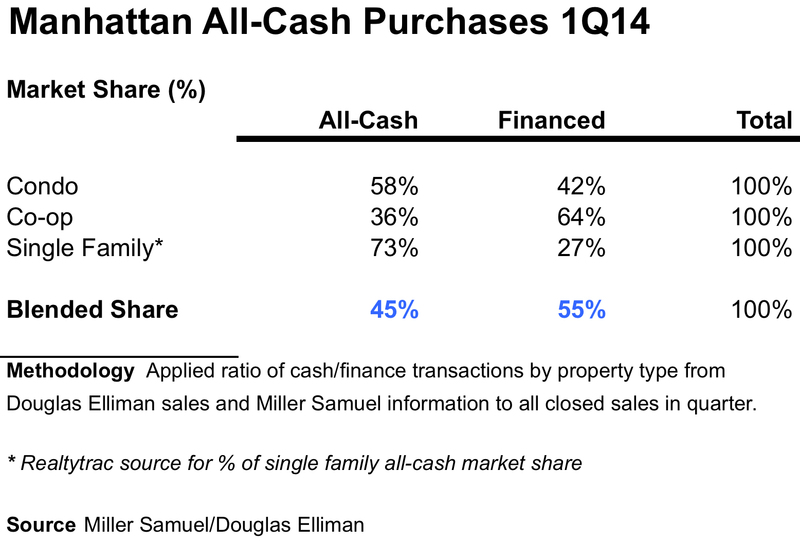 This time it covers the 1Q14 Hamptons Sales Report that we author.